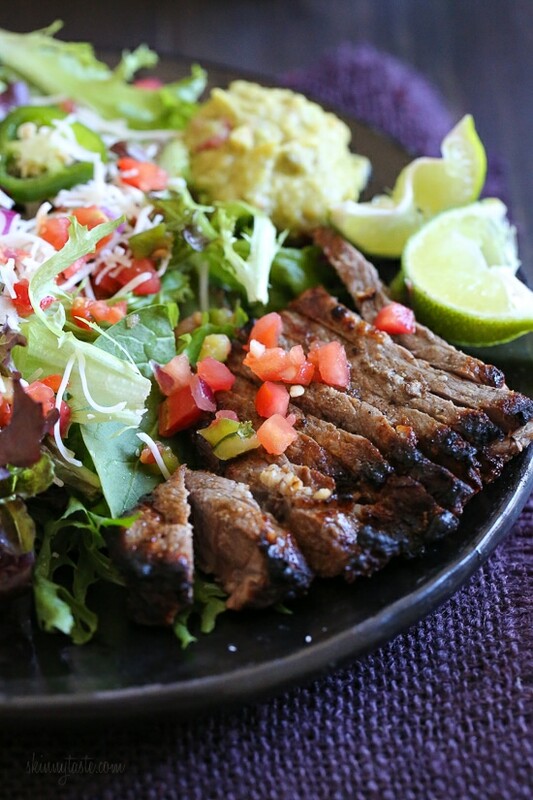 This Carne Asada steak salad is made with everything I love – juicy steak, pico de gallo, Monterey Jack cheese and guacamole. Inspired by my favorite taco salad, it’s quick, tasty, low-carb and high in protein which fills you up and leaves you satisfied. I have partnered with Beef. 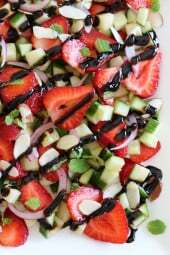 It’s What’s For Dinner to share this awesome salad I think you’ll love! 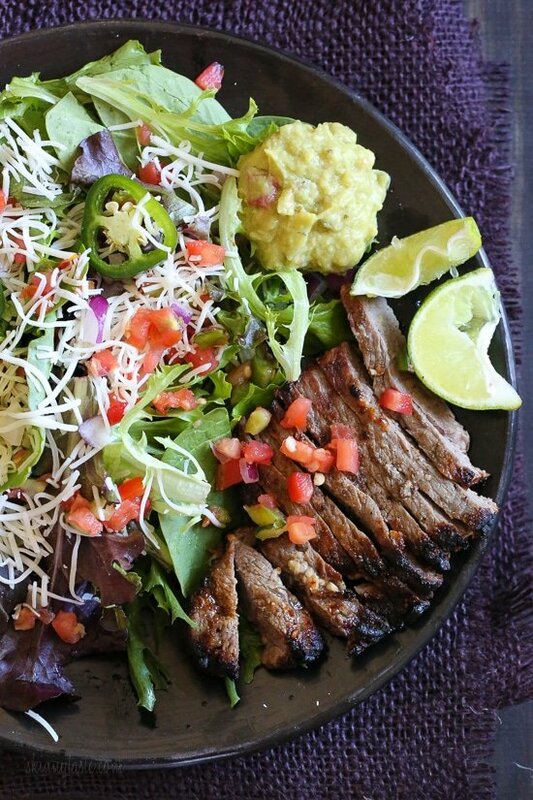 The dressing is simple, I top it with pico de gallo and squeeze fresh lime juice over everything! I love steak, it’s by far one of my favorite things to eat quick when I want something QUICK that everyone will love. My husband is also a steak lover, but he’s pickier about the cut of steak he selects. NY strip steak is on his list of top three because it’s juicy and tender. This recipe is inspired by the new Beef. It’s What’s For Dinner website. Such a great resource for all things beef! With over 126 cuts, we often need a little help demystifying cooking with beef, and their new website is equipped with a guide for every cut: where it comes from, how to cook it and all the nutritional information. There are many names for Strip Steak depending on where you live. It’s also known as: Ambassador Steak; Beef Loin, Strip Loin Steak, Bone In, Center-Cut; Club Steak; Country Club Steak; Delmonico Steak; Hotel Cut Steak; Kansas City Steak; Kansas City Strip Steak; New York Strip Steak; NY Strip Steak; Shell Steak; Strip Loin Steak and Top Loin Steak. How do you know when the steak is done? Beef’s tender, juicy texture is optimum when cooked to medium rare (145°F) to medium (160°F) doneness. To determine doneness, insert an instant-read thermometer horizontally into the side of steaks. Place the thermometer in the thickest part or center of the steak. The thermometer should not touch bone, fat or the grill. 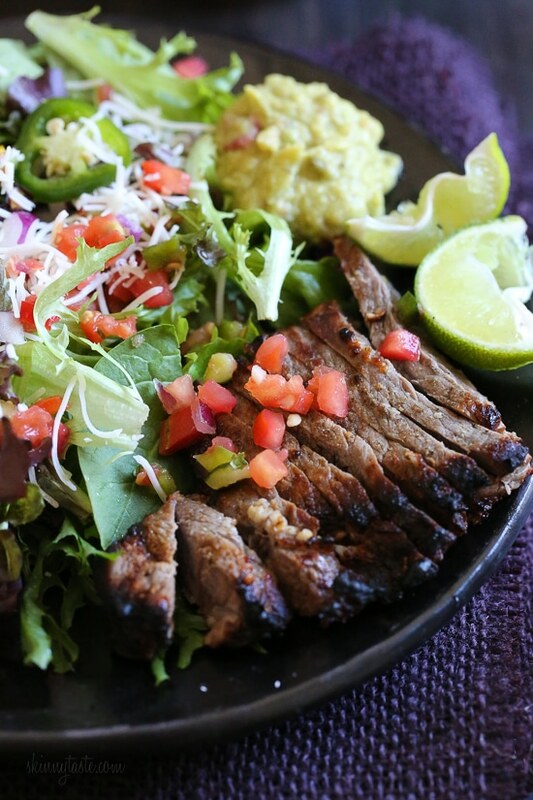 This Carne Asada steak salad is made with everything I love – juicy steak, pico de gallo, Monterey Jack cheese and guacamole. 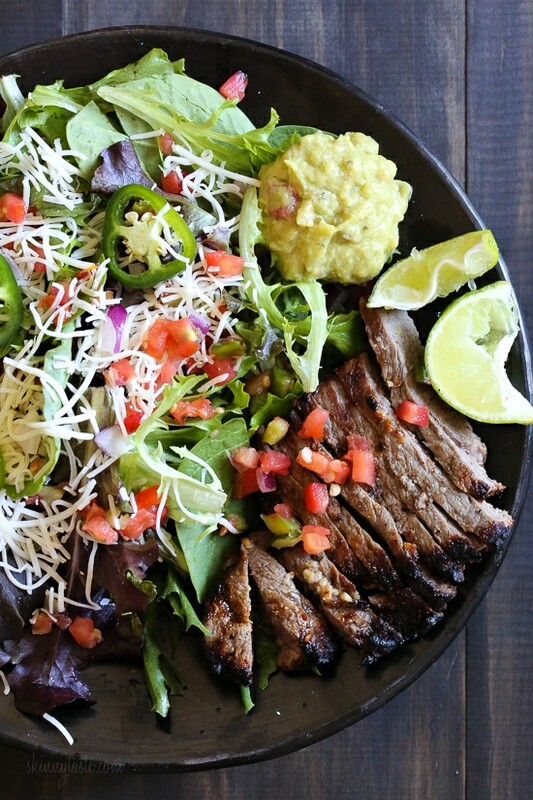 Inspired by my favorite taco salad, it’s quick, tasty, low-carb and high in protein which fills you up and leaves you satisfied. 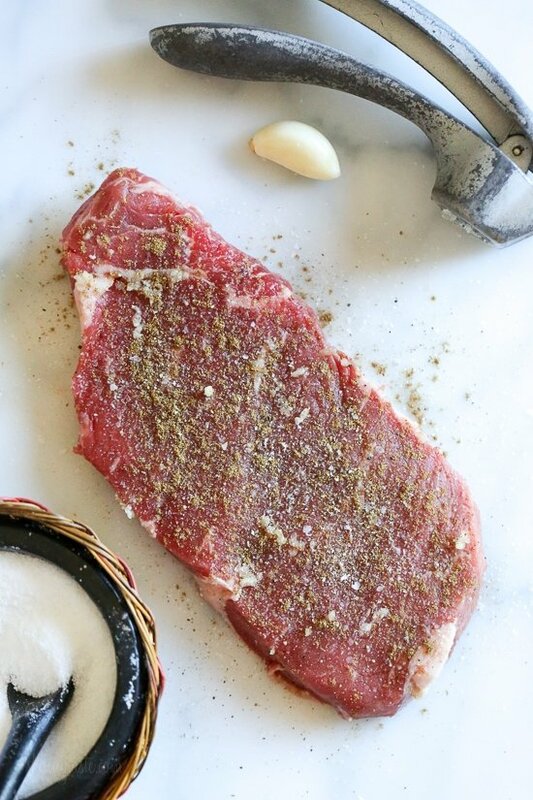 Rub garlic all over meat then season with salt, cumin and black pepper. To broil, place steak on rack in broiler pan so surface of beef is 3 to 4 inches from heat. Broil about 3 minutes on each side for medium rare to medium. To grill, heat the grill and oil the grates. When hot, grill over medium-high heat about 3 minutes on each side for medium rare to medium. To cook in a skillet, Heat a skillet over high heat and let the skillet get very hot. When it’s hot, spray with oil and cook the steaks about 3 minutes on each side for medium rare to medium. Squeeze juice from 1 lime wedge over each steak. Slice Steaks into thin slices. To serve, divide the lettuce, pico de gallo, cheese and guacamole between two plates. Serve with steak; garnish with lime wedges and jalapeño, if desired. Disclosure: This post was sponsored by Beef. It’s What’s For Dinner. Thank you for supporting the brands that make Skinnytaste possible. All thoughts are my own. Gina- Thank you for including a skillet version! I can’t always grill where I live so it’s nice to have the option to use the stove. A lot of recipes will only show instructions for the grill so I end up skipping them. Just wanted to say thanks!! Loved this recipe so much! 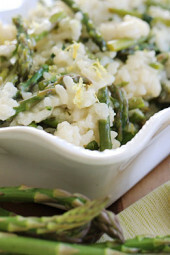 So delicious and super quick to make!! I forgot to mention that I added a little paprika and some chipotle chili powder to the steak dry rub. It was delicious! I made this tonight and it was CRAZY GOOD! So quick to make, keto-friendly, and even the kids loved it. Definitely making this again, thanks!! What would the calories be without the guacamole? This was easy, fast and delicious. Broke us out of our standard grill a flank status and serve with broccoli routine. 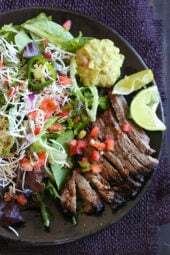 My non-salad -eating kids made tacos with the steak while my husband and I had lovely salads using greens from a friend’s garden. Going in the summer rotation! Could I use flank steak? I’ve always had a problem with hot and cold foods together. Do you think this would be just as good if I waited for the steak to chill a bit? Loved it. I bought a cut of steak that was a little too tough, so that wasn’t great – but the way all the flavors melded together was pretty awesome! If I get a great steak deal in the future I’ll for sure make it again! This was a great recipe. I thought it may be a little dry without dressing, but it wasn’t at all. The seasoning for the steak paired well with the guacamole and pico de gallo. We used the sous vide to cook the steak. Thanks for the tasty recipe, as always! Why is this not Paleo? Would this be zero points now without the guac and cheese? I put the ingredients in the WW recipe builder and it still counted the meat. I even did flank steak to make it “leaner.” Hmm…Still getting used to freestyle! 2 thumbs up for taste and fast on the table in under 30 min! This is on repeat for us! Loved it! Had carne asada in a Mexican restaurant in Augusta GA about a month ago for the first time; it was horrible, but I was pretty sure it was the restaurant. Wanted to try my hand at it, and your recipe came along at just the right time. The two of us cleaned our plates! Thank you! Looks great but how would you modify it to use chicken? How would you prepare the chicken as my husband doesn’t eat beef. Thanks Gina love your recipes! What is the white side on the top right? Polenta? Potatoes? Biscuit? I don’t see it in the recipe. Sure looks like potato salad. 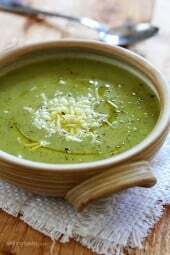 Guacamole would be greenish, although recipe says guacamole. What is the white side of the top right? Polenta? Potatoes? Biscuit? I don’t see it in the recipe.